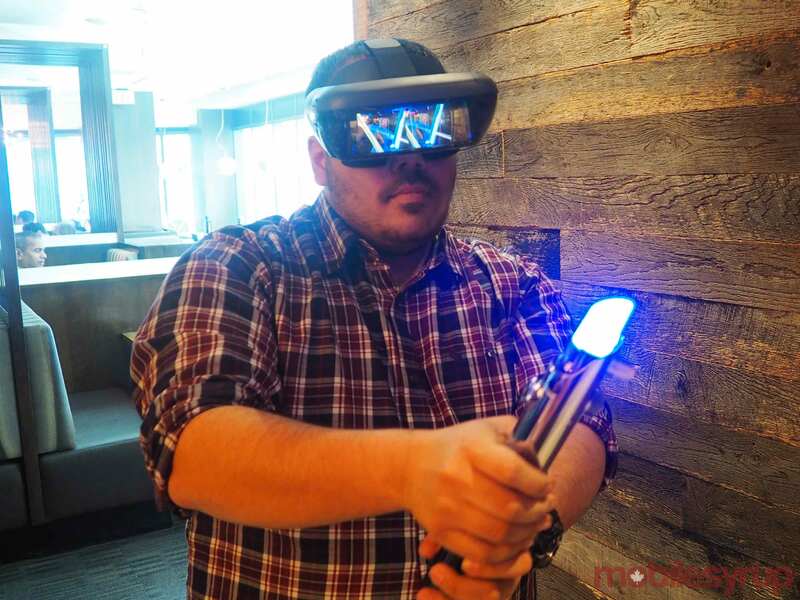 On paper, Lenovo’s Star Wars: Jedi Challenges augmented reality headset is a great idea. 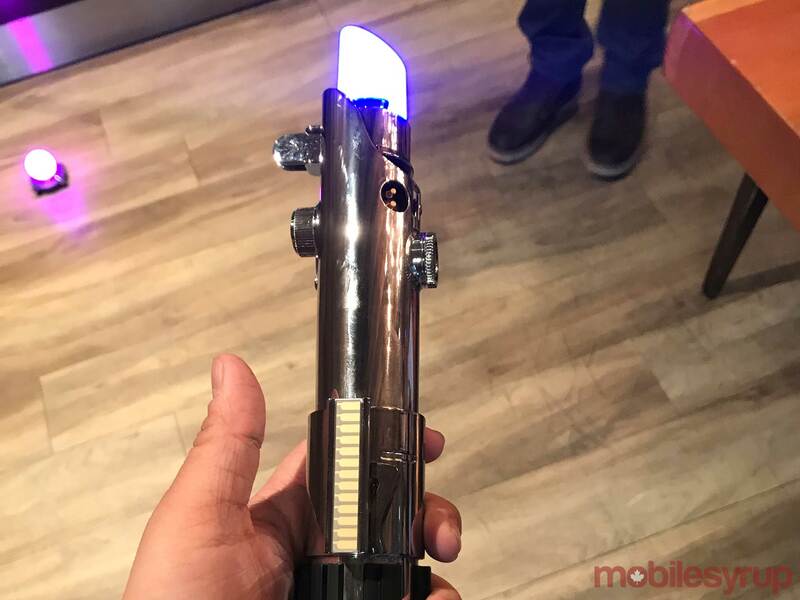 An AR device that only requires a smartphone and include motion control lightsaber to let you feel like the ultimate Jedi warrior? Sign me up. 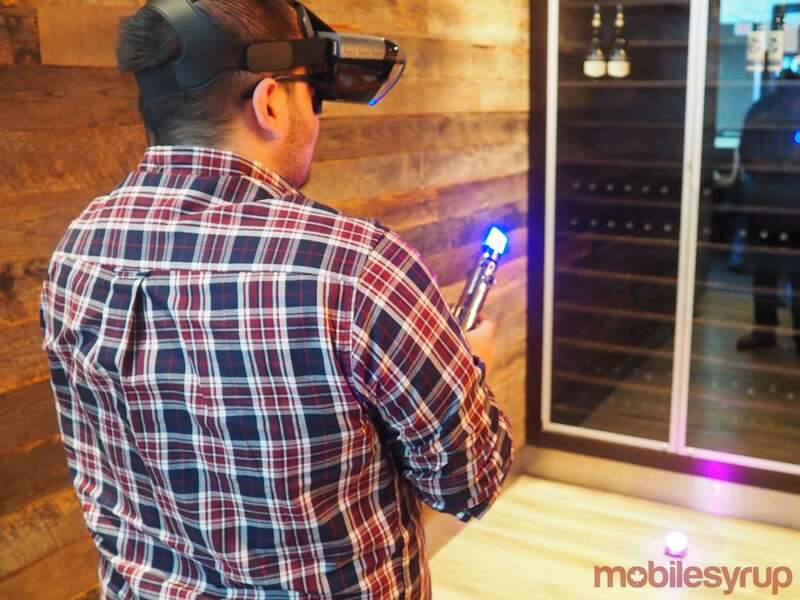 At a recent media event in Toronto, I found that Jedi Challenges did indeed succeed in that regard, offering the ultimate engaging lightsaber experience — for a while, at least. 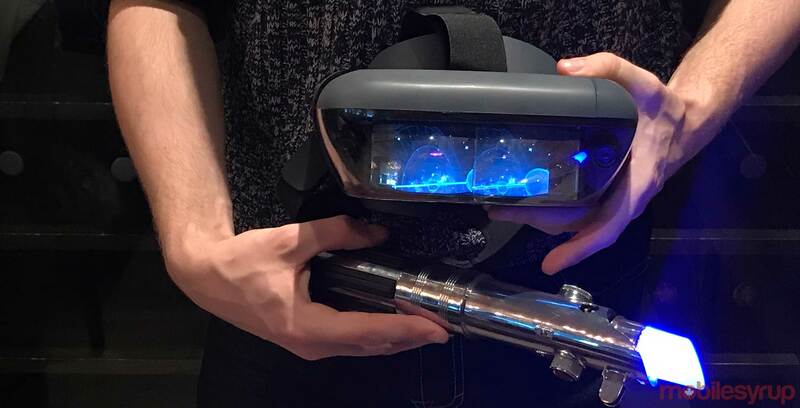 Packed in with the Mirage AR headset is a motion-tracking beacon and lightsaber hilt for you to swing around in AR-simulated duels. Star Wars fans will surely recognize that the lightsaber belongs to Anakin Skywalker, which was later passed on to Luke and then Rey. A free iOS and Android companion smartphone app must also be installed, with phone models like the iPhone 6 and Samsung Galaxy S6 or later supported. It’s worth noting that because Lenovo already had the headsets prepared for the demos, I wasn’t able to see how easy the setup process is. One of the most important elements of a headset is how comfortable it feels, and this is one area where the Mirage AR really excels. Weighing in at 1030g, the headset is light and, thankfully, never felt clunky during my multiple playtime sessions. What’s more, the headset can snugly accommodate glasses, which is a necessity for bespectacled people like me. Likewise, requiring a smartphone only means you don’t have to deal with the rather cumbersome multi-cable setups of higher-end headsets. That said, $289.99 CAD is by no means a small chunk of change, so that begs the question: does the content offering justify the hefty price tag? Jedi Challenges’ most prominent feature is, naturally, its ‘Lightsaber Duels’ mode, which pits you against the likes of Darth Vader, Darth Maul and Kylo Ren, as well as stormtroopers, droids and other enemies. Activating the lightsaber for the first time and seeing the holographic blue blade shoot up is incredibly neat. More to the point, though, I was most impressed with how good it feels to use the lightsaber. Motion control gameplay can often feel imprecise, but swinging the blade around worked surprisingly well. When in a prequel-era mission, I was particularly impressed with how the spindly droids would fall apart depending on where I slashed at them. Delightfully, I was able to cut off specific arms, heads, legs and even the barrels of guns, making me feel like a skilled Jedi Knight. You can also deflect blaster bolts by positioning your blade towards enemies, which feels really satisfying to pull off. In battles with lightsaber-wielding foes, the game can get even more thrilling. On-screen flashes will warn you of the direction of incoming attacks (which can come from many different angles), and successfully parrying all of the blows will leave your enemy vulnerable to a powerful counter move. Kylo Ren in particular comes at you with an unbridled fury, making it rather tense as you try to block his barrage of attacks. You’ll also be able to equip a Force power before the battle starts, with options including Force Speed (slowing your foe down momentarily) or Force Push (sending enemies flying). In combat, these can be executed by pressing the same button you ignite your lightsaber with. The noisy setting I was in made it rather hard to hear the sounds in the headset, but they were certainly authentically Star Wars. Your opponents also talk during the game, adding more life to their already solid character models and animations. At one point, I caught Ren saying “I have failed you, grandfather” when I beat him, referring, of course, to Darth Vader. To Lenovo’s credit, the Jedi Challenges experience could have just been a lightsaber duels simulator, but instead, it features two other full gameplay modes that also span all eras of Star Wars. The second mode, Strategic Combat, is a fun sort of Civilization-lite real-time strategy game. By moving the lightsaber, you’ll be able to position infantry in a battle, with objectives including protecting key starfighters. The mission I played featured Naboo during the climactic battle of The Phantom Menace, and I was able to place and command notable ships, soldiers and even Obi-Wan Kenobi himself to defend my units. 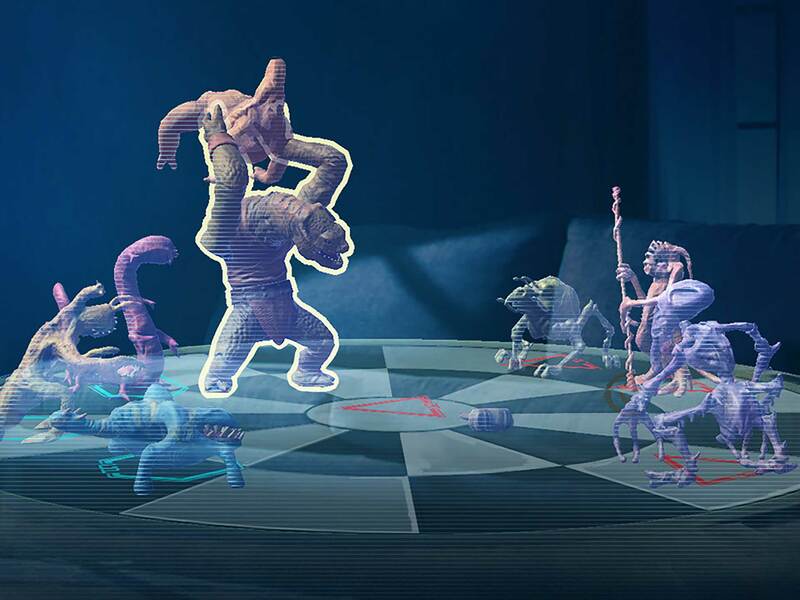 The final mode — by far the weakest addition — is Holochess, a version of the holographic game that Chewbacca and R2-D2 play on the Millennium Falcon in A New Hope. As with Strategic Combat, you’ll sometimes need to be careful with how you manage your pawns, as some do more damage than others. Overall, though, there didn’t seem to be much else to this mode and I quickly got bored with it. 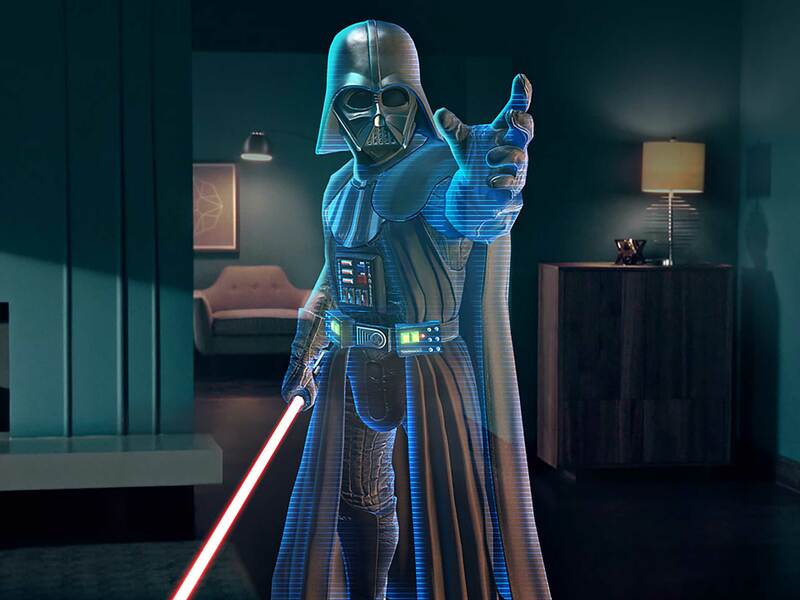 One of the biggest draws of Jedi Challenges is that Lenovo has promised free additional content for the headset, which is released through updates to the smartphone app. The first expansion, centred around The Last Jedi, came out after my hands-on event, so I unfortunately didn’t get a chance to try it out. However, based on a behind-the-scenes trailer, the update promises content related to the new Crait planet, Supreme Leader Snoke’s fearsome Praetorian guards and even a few Porgs. In spite of all this, my biggest concern with Jedi Challenges is that while there are multiple game modes, it’s not entirely clear just how much they have to offer. When asked how many missions or hours of content are included in Jedi Challenges, Lenovo Canada retail executive Chet Joshi didn’t commit to a specific number. Instead, he mentioned that people can play the game for many hours in a day if they wanted to, which doesn’t exactly instil me with confidence that there’s a significant breadth of content. Because I was playing a demo version, I was only able to access a handful of pre-picked missions, making it difficult to gauge any volume of content for myself. Interestingly, though, Joshi said no one in the world has fully completed the game. Doing so will reveal “something special,” he said, although he remained mum on what that might be. On a broader level, one of the biggest challenges with headset-based technology is letting consumers experience it for themselves. Short of actually buying one, your only options are typically finding the occasional public demo or visiting a VR arcade. For that reason, Joshi said that Lenovo has offered public demos in the past — such as in Toronto’s Yonge-Dundas Square, in theatres to coincide with the release of The Last Jedi and at various Best Buy locations. Going forward, Joshi said Lenovo will continue to offer demos in Best Buys and other public spaces in the coming months. But according to Joshi, that’s just the start. A long-term promise is certainly good to hear. For now, though, $289.99 CAD is pretty steep, and being entirely Star Wars-focused is at once Jedi Challenges’ greatest asset and most glaring shortcoming. Featuring Star Wars-only content means that most of what’s featured in the headset is quite fleshed out and entertaining. At the same time, though, it’s unclear just how much you’ll get out of the device. While this may be somewhat remedied with additional content rollouts — such as this week’s The Last Jedi update — I’m ultimately unsure of Jedi Challenge’s long-lasting appeal. Higher-end virtual reality headsets like the PlayStation VR and Oculus Rift have continued to drop in price over time, to the point that they now only cost around two hundred dollars more than Jedi Challenges. Spending that extra chunk of change would give you devices that are capable of so much more than just Star Wars mini-games. At nearly $300, a single-application device like Jedi Challenges is hard to recommend to anyone but perhaps the most avid of Star Wars fans. To be sure, Jedi Challenges is still a novel concept, and one that’s pretty accessible from a hardware perspective to everyday consumers. Further, as with virtual and augmented reality technology as a whole, I expect to see it greatly expanded and improved upon over time. As it stands, though, the headset will make you feel most impressive, but not quite like a Jedi yet. Lenovo Star Wars: Jedi Challenges is available exclusively at Best Buy. The headset normally retails for $289.99 CAD, but it’s currently on sale for $269.99 until January 18th.